"This is a clean way to generate clean fuel," said Deli Wang, professor in the Department of Electrical and Computer Engineering at the UC San Diego Jacobs School of Engineering. Schematic shows the light trapping effect in nanowire arrays. Photons on are bounced between single nanowires and eventually absorbed by them (R). By harvesting more sun light using the vertical nanotree structure, Wangs team has developed a way to produce more hydrogen fuel efficiently compared to planar counterparts where they are reflected off the surface (L). "Hydrogen is considered to be clean fuel compared to fossil fuel because there is no carbon emission, but the hydrogen currently used is not generated cleanly," said Ke Sun, a PhD student in electrical engineering who led the project. 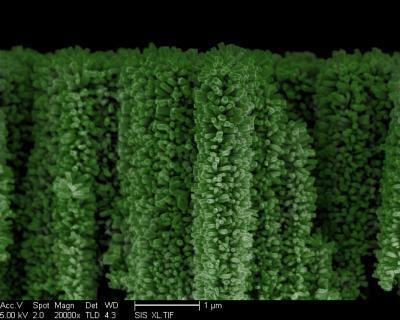 By harvesting more sun light using the vertical nanotree structure, Wang's team has developed a way to produce more hydrogen fuel efficiently compared to planar counterparts. Wang is also affiliated with the California Institute of Telecommunications and Information Technology and the Materials Science and Engineering Program at UC San Diego. The vertical branch structure also maximizes hydrogen gas output, said Sun. For example, on the flat wide surface of a pot of boiling water, bubbles must become large to come to the surface. 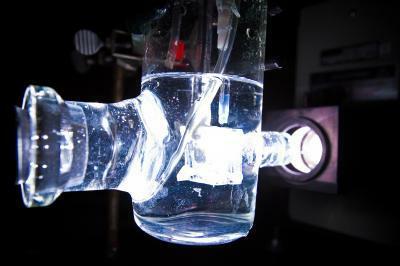 In the nanotree structure, very small gas bubbles of hydrogen can be extracted much faster. "Moreover, with this structure, we have enhanced, by at least 400,000 times, the surface area for chemical reactions," said Sun. In this experiment, nanotree electrodes are submersed in water and illuminated by simulated sun light to measure electricity output of the device.